"M.A.R. Barker has created one of the most detailed and intricate worlds in fiction. 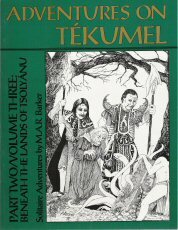 It is often compared to Tolkien's Middle Earth, but Tekumel is very, very different. Barker's style and world generation is actually the equivalent of what is termed "hard science fiction", whereas Tolkien's is true fantasy, or more the model of style for what is termed "soft SF" or "science fantasy." Barker's stories are never "magical" in the sense of the fairy tale, which was the hallmark of Tolkien. They are dynamic, gritty, and overwhelming in their minute details. His entire world, in fact, is set in a far future and based on a science fiction universe of extremely advanced technologies wherein this one world (or perhaps all the universe) has undergone a horrendous trauma (be it war or cosmic cataclysm has yet to be explained, though promised for the new volumes) that severed it from contact with the rest of the universe. The races and their langauges, their artifacts and civilizations, that are depicted by Barker, have all arisen from the ashes of this cataclysm on Tekumel. The legends and religions, in fact, are only echoes of whatever existed thousands of years before. 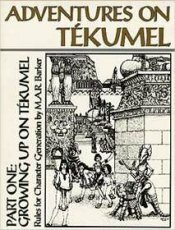 A note about gaming Tekumel: A progression -- nay, a blizzard -- of game companies have tried their hand at Tekumel. Most died with their Tekumel game lines half-completed. TSR published M.A.R. 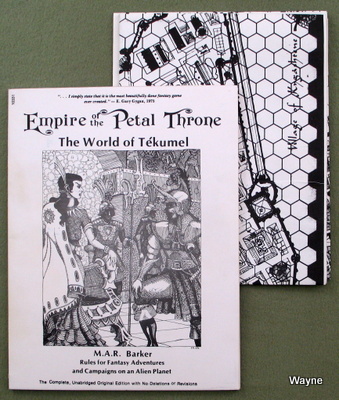 Barker's Tekumel as the "Empire of the Petal Throne" (EPT) in 1975, supported by a handful of articles in the earliest Dragon magazines. 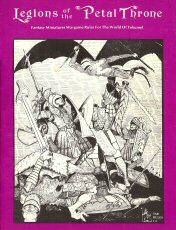 Competing side-by-side with early Dungeons & Dragons, EPT faded quickly from the TSR product line. Barker continued work on his exotic campaign worlduntil his passing in 2012. 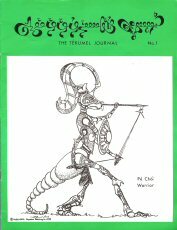 "Tekumel, the world of fantasy and adventure. The setting for this fantasy campaign game is an alien planet, Tekumel, where a cosmic cataclysm stranded human and extra-territorial invaders eons past. A hostile world of poisonous flora and fauna, with intelligent and vengeful native races! Mankind and its allies must battle for survival with nothing save Medieval technology — but magic aids them . . . and there are certain supernatural powers which may intervene. 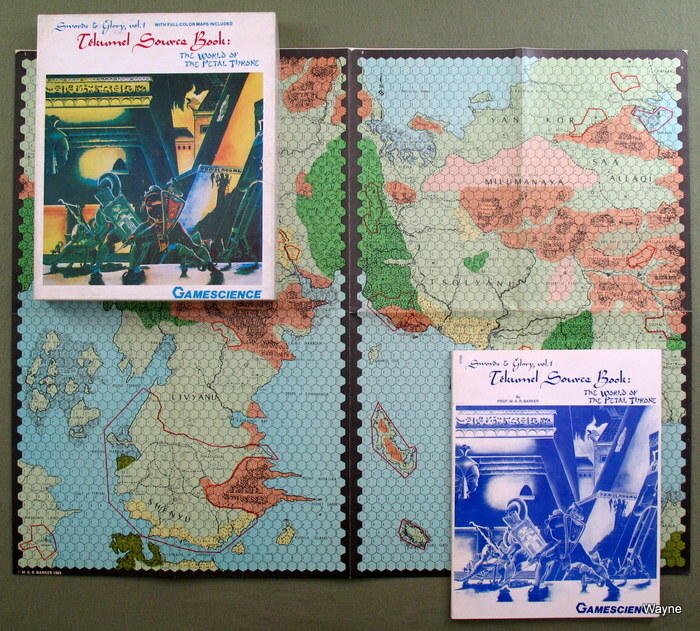 The game contains three large full-color maps and 8 1/4" x 11" book with a brief history of Tekumel, rules, descriptions of various races and creatures involved, and more. Share in this exciting fantasy world by playing EMPIRE OF THE PETAL THRONE." 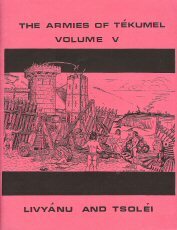 "This rules booklet contains the background information needed for conducting battles with miniature figures in the world of Tekumel. 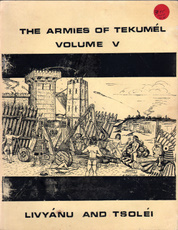 Along with other sections, the rules themselves are of two forms: a Basic Rules set (or Qadarni) to acquaint players with the miniature wargame in its simplest (and quickest) form, and the Advanced Rules (or Qadardali) to allow in-depth exploration of the multi-faceted nature of warfare in the world of Tekumel. These two sets of rules offer a clear choice for the gamer in terms of complexity, but they do share one thing in common — they both utilize the same section of these rules which details the Magic System. Where a different procedure is called for to reflect the difference in complexity, it is discussed within the appropriate section of the Magic System rules. Throughout, the game rules use a 1:100 representation to reduce the massive armies of thousands to individual figures on the tabletop. The exceptions, as noted, are the smaller Tinaliya and Pygmy Folk, which are in a 1:200 representation due to their smaller size. As with EMPIRE OF THE PETAL THRONE, this set of rules is designed for use with a referee, whose duties can include such things as setting up the battle situation, monitoring off-board movement, recording battle results, and assisting with the conduct of the game itself. Although it is possible to fight battles without a referee (more easily the basic game version), the employment of a knowledgeable judge will be beneficial to the ease of play..."
This early & rare game, written by M.A.R. 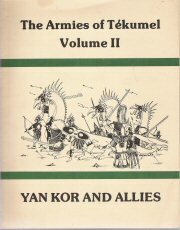 Barker and published by then Tactical Studies Rules (TSR) is not strictly a Tekumel product, but the illustrations by Barker are unmistakably Tekumel-ish in nature. 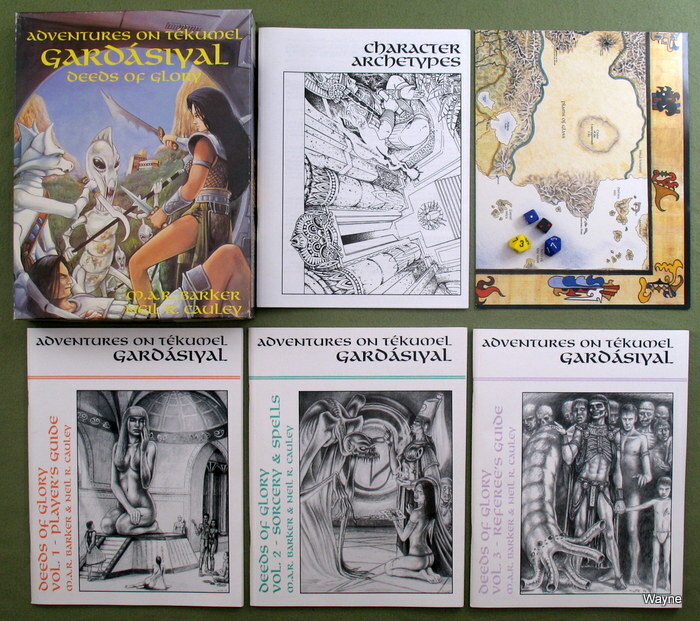 The 1st print set is composed of the 41-page rules booklet (same size as the original D&D "brown" booklets), game board (with rich art), and 2 sheets of counters -- folded-over -- for 532 counters total. The 3rd print (1977) comes in a larger format, 8 1/2" x 11" box. It contains a rules booklet, play mat, 560 counters (inc. several blanks), and 4 unpainted lead miniatures. "The game you have in hand is unique. It is a contest between two players, but it is more than that: it is fantastic. The game depicts a great confrontation -- a Trial by Combat -- where two antagonists conduct a battle employing terrible spells and conjured monsters. Only one of the two contestants can survive this ultimate rivalry. Fantasy and 'swords and sorcery' are proving to be popular topics for games; this is the first, however, which pits two players against one another in an immediately personal way, like chess, while maintaining the enjoyment of fantasy and the imagination. 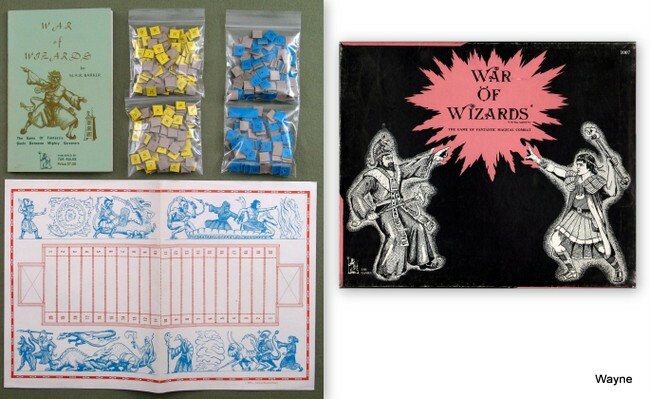 WAR OF WIZARDS thus contains all the elements of the best of two-player games. The equipment needed for the game is not complex) the rules are reasonably short and easily understood. The game system is very simpler just place the counters on the board, move them, and if hostile counters meet, consult the appropriate combat table and roll a die. 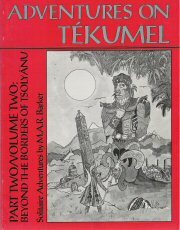 "A distinctive feature of the Tekumel mythos is that it was first presented not as a novel, a comic, or a movie, but as a game. For this reason, when it first appeared in the summer of 1975, critics termed it too personal a creation to be a success. Instead, it has become a milestone in the development of fantasy gaining. 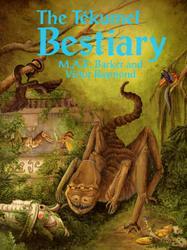 Based on Prof. M. A. R. Barker's world of Tekumel, a science-fantasy creation some forty years in the making, its sweeping imaginative scope and fastidious attention to detail have sketched out an alternate reality as compelling as any known. Close association with Prof. Barker has given my colleagues and me access to a vast wealth of information which is not, and might never be available to others interested in the Tekumel mythos. This has presented us with a unique opportunity -~ and an obligation -- to share those facets of a world which might otherwise remain in shadow. 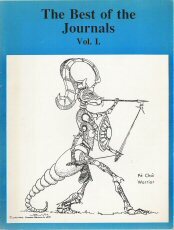 ARTICLES: Journal Notes; Dispatches in the Imperium; The Chyrstalli; Ksarul - Prince of the Blue Room. Discussion of the magical arts and religion with an emphasis on demonology, summonings, demon abilities, and banishment rituals. No game mechanics. 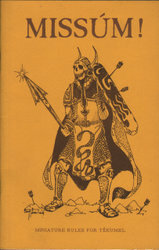 Later re-printed in a larger format, with a black cover, by TOME. 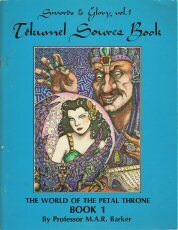 The first edition of this set of rules was begun before the official unveiling of EMPIRE OF THE PETAL THRONE© at GenCon VIII in August 1975. Two sections of that first set have survived virtually unchanged in the present work: Magic and "eyes". Since then there have been six "final" rewrites of three basic editions, including ten different combat systems, and countless additions and changes in factors of morale, movement, scale, and the like. Throughout, however, the goal of the writing remained unchanged. Simulation was emphasized over "game" elements, and, until the recent discovery of the Tane peoples and the Bazhaq, there was no aspect of organized warfare on Tekumel that was not factored into the rules. The constant assistance of Prof. Barker in the playtesting of the rules, with resulting criticisms and commentary, has gone far to assure the success of the simultation. A large body of as yet unpublished material has been used in the design of the rules, including a legion-by-legion description of the armies of the four empires and the Yan Koryani alliance. 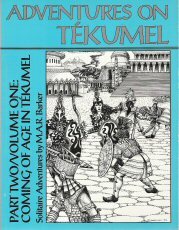 This material will be published as soon as possible, and should add immensely to the enjoyment of fighting Tekumel's wars in miniature. MISSUM! provides the basics of play. The elements of the rules heavily emphasizing realism will be provided in a second volume: MISSUMDALIOKOI!. The Tane will be included, as well as extensive sections on formations, command, army composition, and the original basic factors of the combat system, including levels, steel and magic arms and armor, and individual combat. The rules have been written on the assumption that a referee is not present. If a referee is present, many of the minor rules concerning secrecy of movement, spell transfer, etc. can be changed to reflect this. In closing I must extend my thanks to all those whose help and ideas during playtesting have immeasurably improved the current work, especially Craig Smith; and very special thanks to Prof. Barker, whose heroic efforts proofreading the fifth "final" rewriting are heavily reflected in such clarity of presentation this edition possesses." "...In view of all of this, it is very important for students of Tsolyani culture to have access to some of the more important events in the histories of the Imperial Legions. Without these materials it will be impossible to perceive the Tsolyani army as its members and its society see it. It is impossible, of course, to present a complete history of each Legion — particularly those which go back to legendary and mythological periods before the present Tsolyani Empire. But it is possible to comprehend enough of those events which transpired since the accession of the first Tlakotani Emperor to see something; of the history and development of the Legions alluded to above. A list of the dates and titles of the Emperors of the Second Imperium is thus appended below..."
CONTENTS: INTRODUCTION; GRAMMAR; A GUIDE FOR TRAVELLERS. 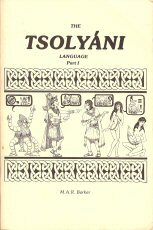 CONTENTS: English-Tsolyani Vocabulary; Measurements; Tsolyani-English Vocabulary; Script. A lavishly detailed guide to the legions of Tsolyánu, the principal empire of M.A.R. Barker's Tekumel. Drawings, troop lists, and an essay by M.A.R. Barker can be found here. Empire of the Petal Throne. 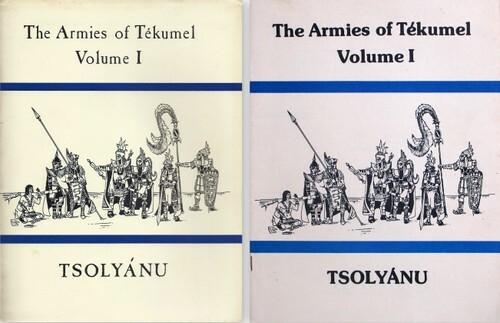 Army lists, including illustrations, for the 85 legions of the nation of Tsolyánu. Missúm and Qadardalikoi stats. 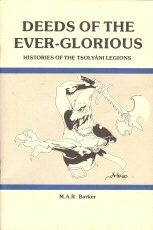 A lavishly detailed guide to the legions of Tsolyánu's enemies: Yan Kor; Saa Allaqi; Milumanaya; Pijena; and Ghaton. Drawings, troop lists, and miniature painting details. The font is tiny, so there is a mountain of information packed in these pages. Gamescience's 1983 reprint of the original EPT rules. 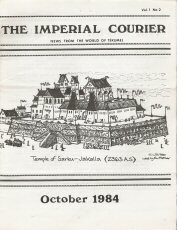 It includes a large B&W map of Jakalla. Extremely rare Tekumel box set. 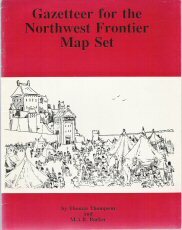 Contains 136-page rulebook and large, double-sided color poster map of the lands in and around the Tsolyani Empire. Extremely rare Tekumel box set. 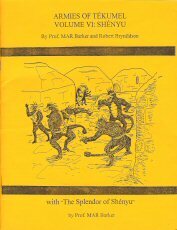 Contains 240-page rulebook; 12-page Sorcery Summary; 16-page Combat Summary; 8(! )-page character sheet; 2 polyhedra dice. "This set of six maps was first drawn for the use of the players in Professor M.A.R. Barker's own EMPIRE OF THE PETAL THRONE campaign. The artist, Craig Smith, produced them after extensive research and consultation with Professor Barker. Since their inception, they have proved to be most useful in the adventures of players in several campaigns. The locations and ancient sites on these maps have provided many hours of danger, excitement, and enjoyment; however, many of the old ruins have not yet been explored and must be presumed dangerous! This set of maps covers the area from Pijnar in the northwest to Khirgar in the south; thus, sections of Pijena, western Mitumanaya, and the northern border of the Seal Empire of Tsolyanu are detailed. 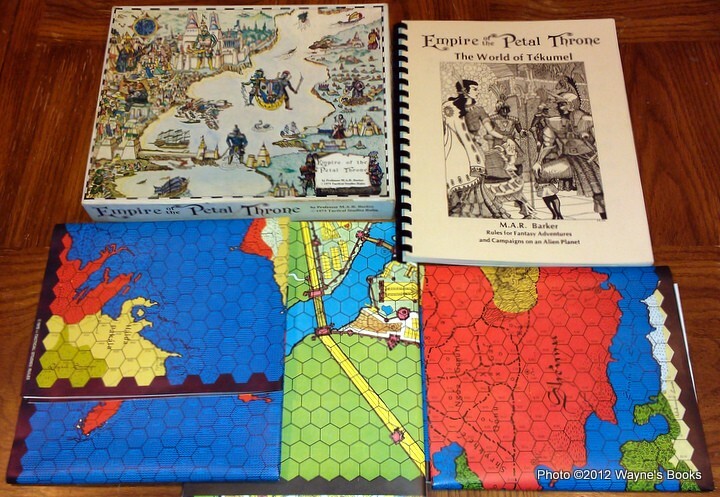 Each of the large hexes on the maps corresponds to the same-numbered hex on the large campaign maps supplied with the boxed game, EMPIRE OF THE PETAL THRONE . Each of these with heavy borders is approximately 133 kilometers across; the smaller hexes on these maps are thus 9.5 kilometers in width." "INTRODUCTION: Some guidelines for the incorporation of military magic have already been summarised in section 2.960 of Swords and Glory, One may also consult "Qadardaltkoi" (by Jeff Berry and MAR. 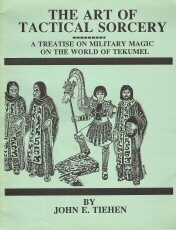 Barker, Tekumel Journal, 1983) and "Missum" (by Gary Rudolph, Imperium Publishing Co., 1978) for further details on the employment of military magic, as well as legion level combat. The purpose of this discourse on military magic is to streamline the integration of military magic into the adventure campaigns of player characters. Perhaps referees will find these parameters useful in meshing their player character's skeins of destiny more smoothly with the destinies of the Ever-Glorious Legions of the Petal Throne. 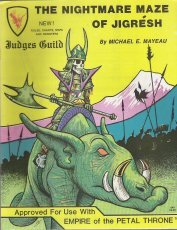 The following guidelines are designed for use with the Swords and Glory adventure rules (see 2.0) and the Empire of the Petal Throne adventure rules (see 3.0)..."
ARTICLES: Seal of the Imperium; Military Formations of the Nations of the Universe; Percentile Roll to Obtain an "Eye"; Jakalla Encounters; Legions of the Petal Throne Painting Guide; Creature Features; The Battle of the Temple of Chanis: 2020 A.S.; The Temple of Thumis, Sage of the Gods; Selected Biographies; On Customs: The Meshqu. 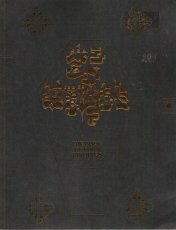 ARTICLES: Tsolyani Names Without Tears; Mu'ugalavyani; Classical Tsolyani; The Kazhra ve Ngakome; Llyani; The Temple of Ksarul; The Temple of Vimuhla; The Temple of Karakan; Seal of the Imperium; The Splendor of Shenyu; The Chyrstalli; The Pe Choi; The Tinalaya; A Thousand Flowers. 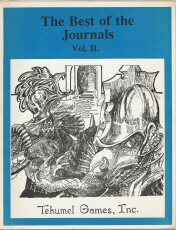 ARTICLES: The Battle of Ry; The Clan of Crimson Ivory; Swords and Glory - Errata; A Merchant's Tale; Kevuk - A dice game; Coinage of Tekumel; The Tsolyani Week; A Visit to the Armourers'; Marching with the Ever-Glorious; Selected Biographical Information: The Clan of the Utter Dark; The High Seas of Tekumel; The Underworld; New Magical Items for EPT; The Hirilakte Arena; Staffs of Power; Encounters in the Empire; NPC Personalities in EPT; Index to all three volumes of The Best of the Journals. 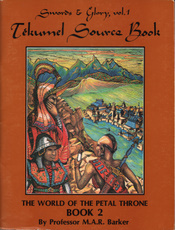 Tekumel, the world of fantasy and adventure. The setting for this fantasy campaign game is an alien planet, Tekumel, where a cosmic cataclysm stranded human and extra-territorial invaders eons past. A hostile world of poisonous flora and fauna, with intelligent and vengeful native races! Mankind and its allies must battle for survival with nothing save Medieval technology — but magic aids them . . . and there are certain supernatural powers which may intervene. NEW, EASY-TO-PLAY, ONE-VOLUME EDITION COMPLETE AND UNABRIDGED"
The Different Worlds "Pink Book" edition. Different Worlds partial reprint of Swords & Glory Vol.1 from Gamescience. Includes Introduction; Astronomical Data; Early History; The Historical Empires; Physical Ethnology; & Family, Lineage, and Clan. Different Worlds partial reprint of Swords & Glory Vol.1 from Gamescience. Includes religion and magic, social groups and institutional and organisational structures. This set by short-lived Theatre of the Mind (TOME) -- weren't ALL of the Tekumel companies short-lived? -- is scarce & coveted for its depth & detail. The interior drawings are some of the best I've seen in Tekumel art I've seen. TOME published several follow-up supplements. More than you dreamed existed..."
* Join a trading caravan and travel to distant places! Meet interesting natives and trade for strange antiquities, Go see places long forbidden to foreigners, Get into more trouble than you bargained for.,. "Sixty millennia in our future: Thousands of species of plants and animals are brought to the remote planet of Tekumel by explorers, wanderers and merchant princes from a myriad of worlds and a score of races. Vast estates, parks, zoological gardens overflowing with exotic life, islands devoted to pleasure, each with its own ecology according to the whims of its lord. The Time of Darkness: Tekumel's solar system is thrust into a 'pocket dimension' — cut off from the other stars of Humanspace. Chaos, catastrophe, an end to shipments of metals to iron-poor Tekumel comprise the new order. A slow spiral downward through the tattered glories of the Latter Times to the sprawling barbaric empires of today. This book describes a small portion of the flora and fauna of Tekumel: descriptions, habitats and relations with humankind are listed for every creature. 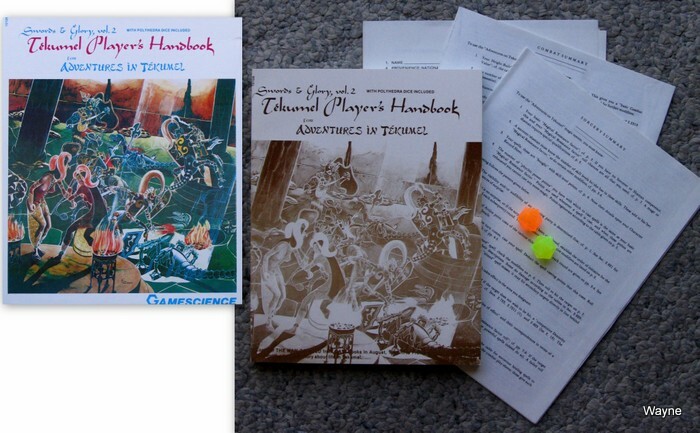 Included are game statistics, illustrations, referee hints and an index to help you fit the creatures of Tekumel into your roleplaying games. 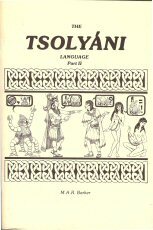 For those who enjoy truly different fantasy realms..."
"Preface: The first part of this book consists of an introduction to the religion of Tsolyanu, its deities and cosmology, plus a brief discussion of its magical arts, the planes of being, and the various creatures which inhabit these latter. The second section of this work then presents a translation of The Book of Ebon Bindings, one of the most complete and detailed texts on the subject of Tsolyani demonology now found in the Five Empires. The introduction is itself a translation from the work of one of the writer's oldest friends and mentors, Tse'mel [roughly = "Cardinal"] Qure'n hiKe'dcolel, High Ritual Priest of the temple of Lord Ksarul at Be"y Su. In response to questions put by various foreign students resident in the Tsolyani capital, Tse'mel Qure'n had kindly summarized the series of lectures which he regularly gives to acolytes entering his priesthood. He has modified this summary somewhat so that it will be suitable for those unfamiliar with Tsolyani mores and beliefs. The writer wishes to extend his thanks to Tse'mel Qure'n, as well as to other friends in the Temple of Lord Ksarul for their kindness, patience, and willingness to explain the intricacies of their faith. The writer is neither a philosopher nor a theologian, and the task has not been an easy one for his Tsolyani colleagues. Particular thanks are due to Mr. Trasune' hiTankolei and Miss Kalusu hiViridame, who joined in the work of translation, corrected the author's errors, and proofread this manuscript..."
"In a pocket universe, millennia removed from our own, lies a system of five planets engineered by forgotten planetary-scale technologies. The vibrant world of Tekumel, once a busy interstellar crossroads terraformed to suit the needs of its brutal rulers, was isolated over 30,000 years ago when the stars went out. What emerged from this Time of Darkness was a world forged in disaster, but strong in custom, history, life... and death. Professor M.A.R. 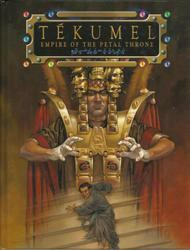 Barker has devoted over 50 years to creating the Tekumel universe, developing it into a vivid science-fantasy setting with rich backgrounds and unique cultural identities. 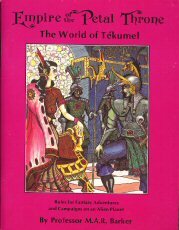 Inspired not only by the pulp SF and fantasy of the mid-20th Century, but also by the rich civilisations of Moghul India, Ancient Egypt, and the Aztecs, Tekumel sets the stage for a role-playing experience unlike any other. This core rulebook features a system derived from the popular Tri-Stat System, customised to enhance the intricate setting of Tekumel's Five Empires. 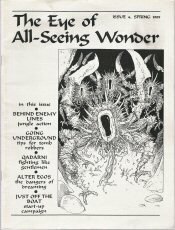 Inside you'll find non-human race templates, a new magic system, alternate combat options, details on clans and military/priesthood service, a select bestiary, and much more. Whether you are a long-time devotee of Barker's work, or a player new to the setting, join us in celebrating the revival of Tekumel: Empire of the Petal Throne." 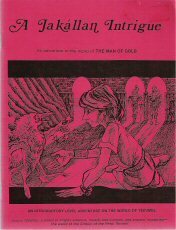 "An adventure in the world of The Man of Gold." 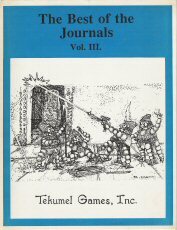 A reprint of the original Tekumel Games publication. Just when you thought it was safe to back into the gaming room, an entire RPG on one page. * The Five Parts of the Self: A spot of soul-searching, as Patrick Brady discusses the subconscious and the unconscious. * In the House of the Rising Sun: The youth of today... our Japan correspondent Paul Mason puts 'em in their place. O tempura! O mores! * Friends in Foreign Parts: Something's rotten in the state of Mu'ugalavya. A chance for characters to do a spot of detective work. 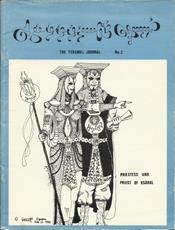 * TIRIKELU: The serialized role-playing game. This issue's instalment concludes the magic rules. No month/date I could find anywhere. I see this from time to time with fanzines, enthusiasts that couldn't be bothered to date their publication. From an ad near the back -- "Coming in 1999!" -- we can infer the mag is ca. 1998. "Introduction: Since the first Tekumel Track at the U-Con game convention held in Ann Arbor, Michigan, in November 1998, a regular part of that program has been a telephone conversation between the Track participants and the creator of Tekumel, Prof. M.A.R. Barker (referred to in the subsequent text as "MARB") of Minneapolis, Minnesota. During these conversations, the discussion usually focused upon the nature of clan life and various more advanced Tekumel topics. 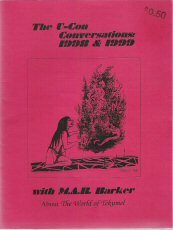 We were fortunate that one of the Track participants, Robert Dushay, had the forethought to take notes at these conversations, and the energy and the time to transcribe tapes of the 1998 and 1999 conversations. The text of these conversations are presented herein."